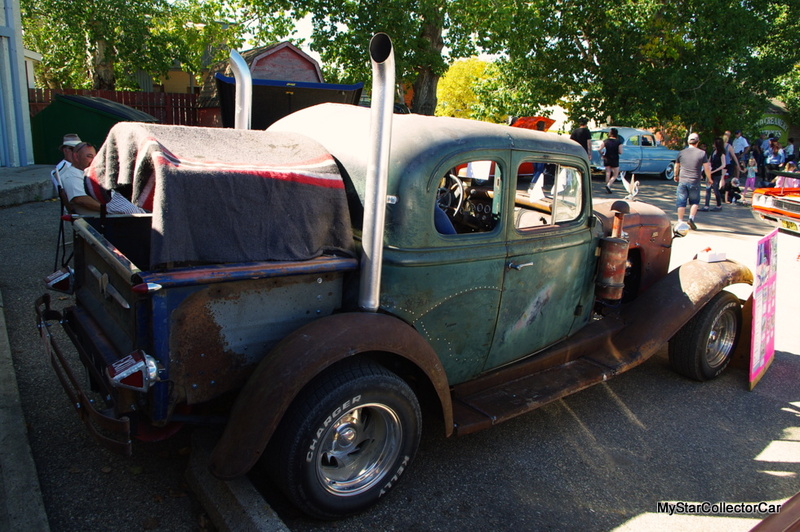 Rat rods are a 21st century offshoot of the old hot rod mantra—find whatever parts you can scrounge and build it. This was a successful strategy then and it definitely works in 2015. 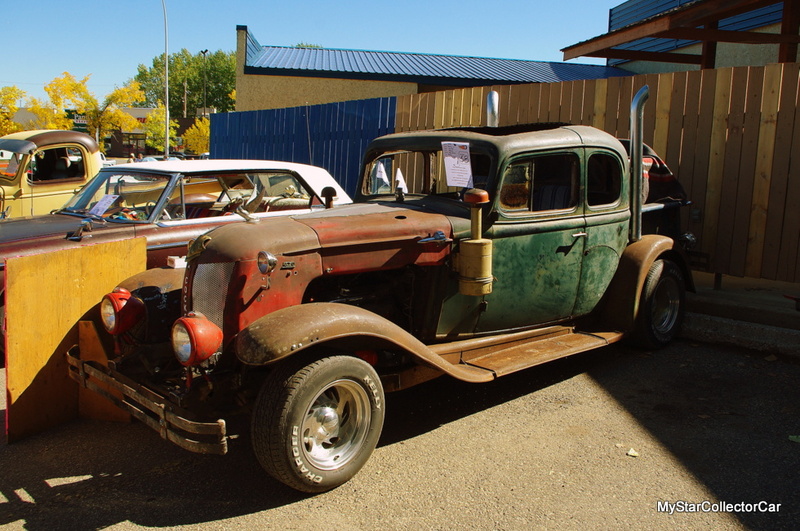 Daryll de Souza had a ’33 Pontiac for 8 years but he had no real game plan so he started thinking about the future of the car. Fortunately, Daryll’s wife, Peggy stepped in and said, “You’re not going to get rid of it-just call Stan (Purcell)”. 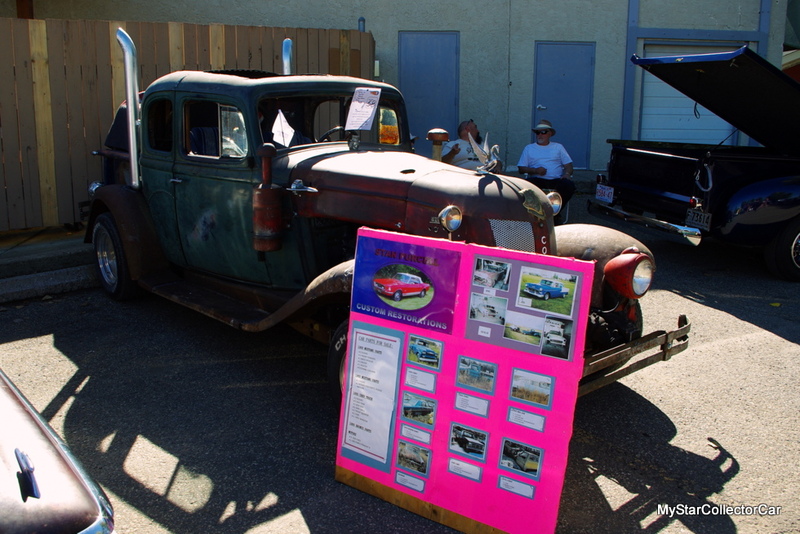 Stan is a veteran car builder and Daryll said Stan “had a vision” for the car. The vision for the car was straight out of the old hot rod tradition where anything is possible if you’re willing to work with what’s lying around and custom fit any concept. 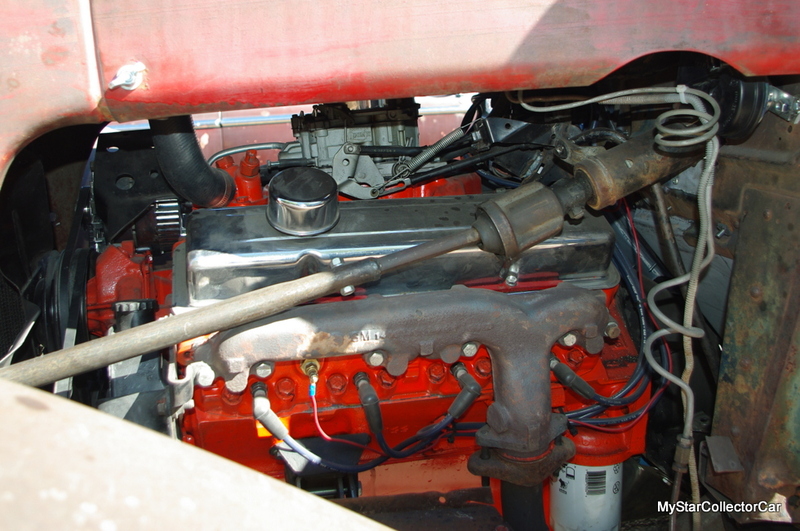 The process began when Stan got rid of the beehive in the passenger door, cut out two doors and added a pickup bed to the old Pontiac after he sat it on a cut-down S-10 frame. 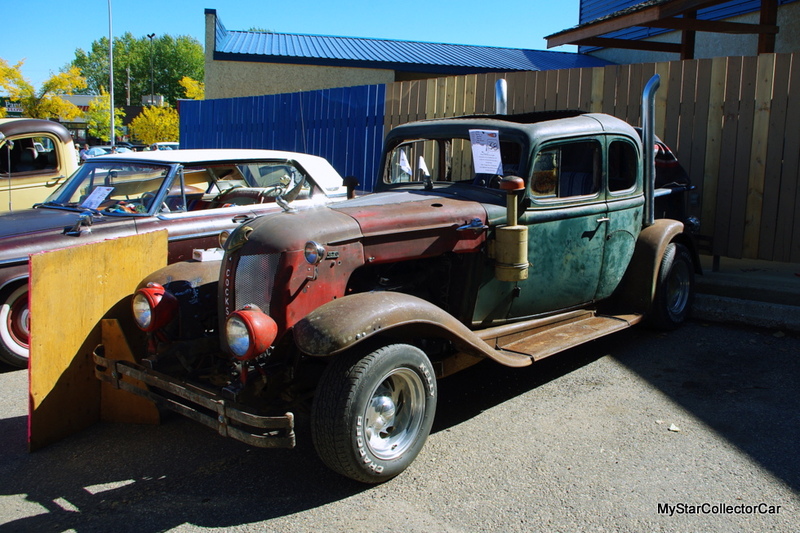 He took the fenders off an old ‘30 Chevy coupe and he fitted a 305 under the hood and added oil bath filters Daryll said—“that actually work”. 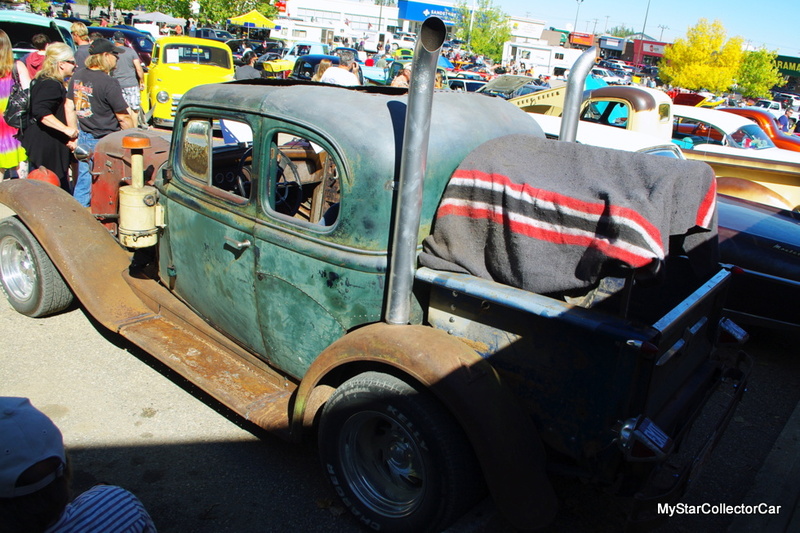 The front radiator came from a Cockshutt tractor and the grill was scavenged from the Calgary Tower. 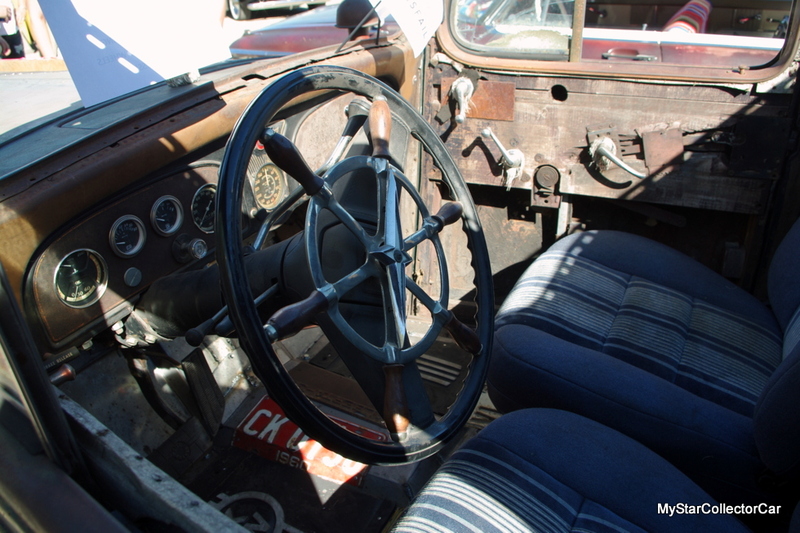 Daryll was really proud of the steering wheel because it came out of an old Peterborough boat and it serves as a great addition to a rat rod in the 21st century. 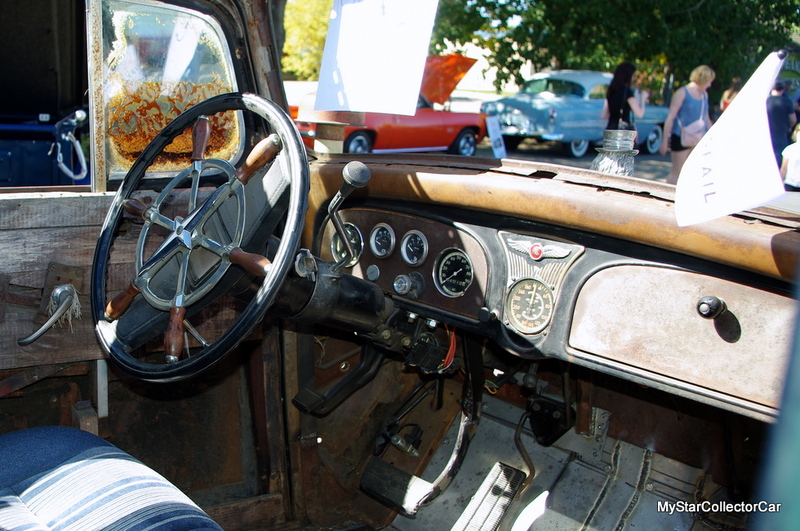 There’s another odd touch in this rattie because this old Pontiac has an air speed indicator to partner with its nautical steering wheel. Daryll wants to add some wood from doors donated by an old family homestead to add to the heritage of this build. They threw out the trashed original Pontiac seats and added more functional Bronco II seats to make the drive a little less painful than sitting on exposed springs. Daryll was particularly impressed with the Corvette mufflers. He described the application as, “Brilliant-would never have thought of that”. He was also sold on the use of motorcycle lights on this rattie. Some of the trim came from an old Merc truck. Daryll said, “ I sold the truck but the trim was meant to come with me” so now it’s on (upside down) on the tailgate of the truck. Daryll gives full credit to Stan because without his role in this project the Ponti-rat would never be a reality. Daryll explained how Stan figured out how to plumb up things like the transmission plus he had a big connection to parts—everything came from connections Stan had to make this ride a reality. Stan is a guy who looks at what he has and then he mentally maps out a game plan by making pieces fit together. This Ponti-rat is a great example of how an old strategy can still apply decades later. Daryll has many plans for this unique ride and he’s the kind of guy who likes to put miles on anything he owns. 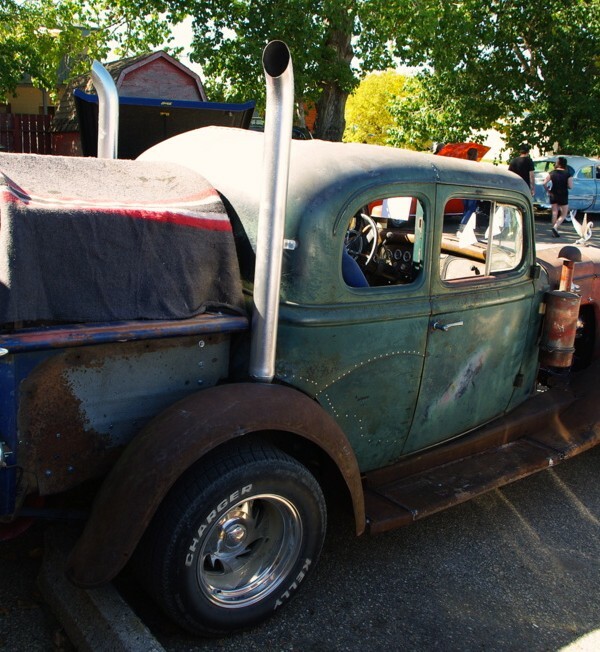 He said the truck turned out “even better than I expected” and he owes it to Stan and his old school build philosophy. The best ideas are time tested.